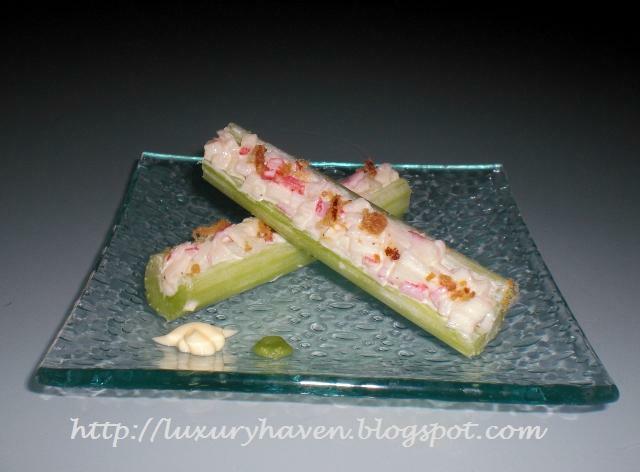 Tickle your taste buds with these charming Celery Sticks topped with Bacon Bits! I’d prepared these refreshing sticks during Jen’s visit @ Be My Friend Forever. Also known as imitation Crab Sticks, the seafood is so economical & versatile. If you were to notice, I use a lot of these crabmeat in my recipes cause it’s so easy to prepare. They’re called “imitation” as it’s processed seafood made of Surimi or Alaska Pollock. In fact, these crab sticks usually do not contain any crab. LOL! 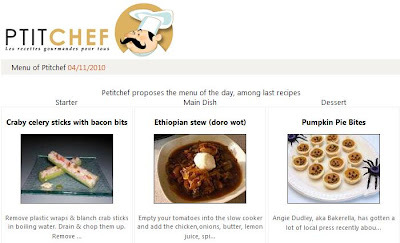 This appetizer is featured @ Ptit Chef as Starter of the Day! Making these Craby Celery Sticks are as easy as ABC & you can give these to your kids as healthy snacks! Remove plastic wraps & blanch crab sticks in boiling water. Drain & chop them up. Remove “veins” from celery by using a vegetable peeler. Cut into 4" or 5" lengths. Combine mayo, wasabi, crabmeat & pepper. Mix well. Lastly, scoop mixture onto celery openings & top with bacon bits. Put them in a tupperware, cover it & keep it chilled. Remove when ready to serve & add a drop of wasabi & mayo for guests with heavier taste. Voila! Those look amazing! I don't think I've had crab sticks before. I am sure I will after I've seen those. That looks so delicious that it makes me so hungry! I just wanted to let you know that I have updated the Last Comments gadget. In an hour or so, you should be able to make it show only visitor comments by entering VS in the field for the custom Display List when you edit the gadget. These crab celery sticks sound really tasty. Crab sticks are quite popular as they are a tasty and convenient ingredient. Also, I took your comment and made clams! I just posted about them yesterday - thanks for the idea!! Anything with bacon bits is good for me! I love bacon! i am following u now too ... and not only that, you are on my blogroll too! you are great!!! This will definitely become one of my favourite salad choice when I am on my detox days...following you from now to get to see more recipes coming my way?? Thanks for sharing! Starwind, thks your visiting & u've such a healthy blog! Aratina, thks so much for the heads-up! Biren, crabsticks are so economical to make esp for a big party. Simply Life, wonderful! I'll be hopping over soon. Penny, I go nuts when I see bacon too. Hahaha! Ian, thks for the gesture! I'll be dropping by more often. Mizuki, thks for visiting & I'd glad my recipes are of good use! Alisha, I found it amusing too. LOL! Yep, makes great snacks for kids & party. Save a lot of money using this. Hahaha! How are you doing? 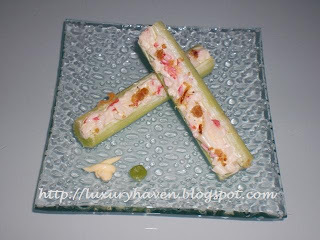 Mock crabsticks ha interesting! Hi Shirley, thks for dropping by again! I'm good & hope u're well too. I've been making fruitless attempts to visit your blog. Is your website down?? I didnt know that, no its not down. Anyway since we've connected on fb, maybe you could access, let me know if its still a problem. These look yummy, Shirley! I'm not a huge fan of celery, but because of your filling I'd definitely give these a try. Love how it's quick and simple to prepare. A kicked up snack for the adults and something enjoyable for the kiddies as well. Thanks for sharing. After seeing this, I think I will suggest to my mom to fill the celery sticks with fish paste next time! Healthy, right? :) Thanks for the idea!